This is the project blog. It includes both computer knowledge and teaching knowledge and how they synergize. Today Conner McCall and Chris Gloege came to my house to help with this initial-list attack. There really is a huge list, and lists of tasks seem to sprout from each item on this list. Thus, while it seems never-ending, I have faith that when one takes a step forward, one is a step nearer the end. Upon booting the server our chandelier started to shake (actually, we don't have a chandelier, but if we did it would have been shaking mightily due to the multiple powerful exhaust fans in the server). Then, effortlessly, we booted a thin client; it sure works smoothly. Conner took up his position in front of the server, Chris in front of the thin client and I, hovered. Anyway, this software is so cool because not only does it run on client machines, one can also concept map on a CMap Server on the net. 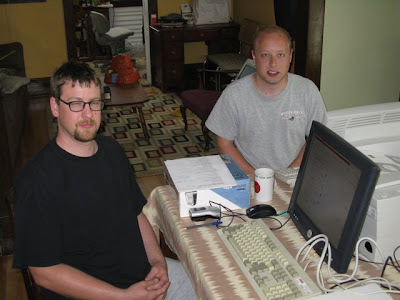 Thanks again to Tom Marble and Jack Ungerleider for helping set up and maintain my Cmap server that's running over at the University of Minnesota in the office of my long-suffering adviser, Gill Roehrig. The concept maps that you see above, while simple jpg images on web pages, are potentialy dynamic: if I make a change on my concept map using the CmapTools app, the jpg on the web page would also change! Thus, upon refreshing the page, or browsing back to it or even to this blog entry, the image would reflect those changes. You will see lots of CMapTools products in the students' work this coming year. Anyway, Connor struggled mightily to make sure that this program would work well on the thin clients and in the end, it does! Also, he had the brilliant idea of creating a wiki for this project where the work can be documented and shared an improved upon list and by others--soon you will see an entry about this wiki. Brian Dolan-Goecke called while we were starting to wind down and came up with some excellent ideas which will be featured in future blog entries, no doubt! Chris was researching some sticky questions on the web and figured out that we don't have to mess with the kernel and that is good news, the kernel pretty much takes care of itself. He also brought with him a CD loaded with different reference materials on thin clients that he found on the Web. Not only were these useful during our work session but, as a matter of fact, a book on thin client system management that he had loaded onto the CD turned out to be addictive reading! Strange, ay?